Serving slow cooker Swedish meatballs for dinner is all about convenience. Prepared gravy and frozen meatballs eliminate most of the work — although you could make your own meatballs from scratch — and the results are delicious. The easy slow cooker Swedish meatballs are made with a non-traditional sour cream sauce. You may substitute heavy cream for the sour cream if you prefer a more traditional flavor, and serve them with boiled potatoes and lingonberry jam, just like in Scandinavia. Sauté mushrooms in butter until tender. In the slow cooker, combine the sauteed mushrooms, gravy, onion, Worcestershire sauce, and allspice. Stir meatballs into the sauce. In a small bowl, slowly stir about 1/2 cup of the hot gravy mixture into the sour cream. Add the sour cream mixture into the slow cooker mixture and cook for 10 minutes longer, or until hot. 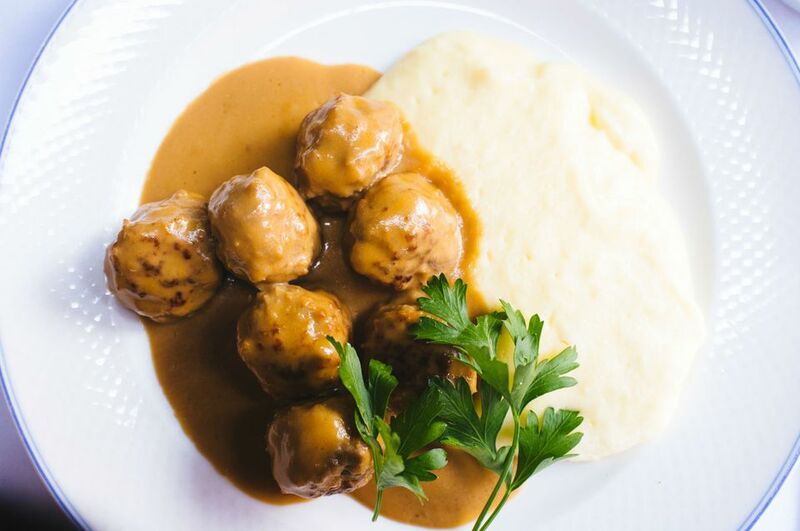 Serve the meatballs over hot buttered noodles or potatoes, whether mashed or boiled, along with a side salad and traditional lingonberry jam. If you can't find lingonberries, use cranberry sauce as a substitute. If you're in a time crunch, set the slow cooker on high for three hours or make the meatballs in an Instant Pot or pressure cooker. if you have an extra-large slow cooker, feel free to double the recipe. Just make sure that all the meatballs are covered with sauce, even if they are stacked on each other. If you only have a small slow cooker, halve the recipe. If you prefer a thicker sauce, pour the liquid out of the slow cooker and into a saucepan once everything is cooked. Bring the sauce to a boil and let it reduce until it's reached the desired thickness. Speed up the process by making a roux out of flour and butter before adding the liquid to the saucepan and whisking the sauce until it's thick. Instant Pot Variation: Set the Instant Pot on saute and melt the butter. Add the mushrooms and saute until tender. Add the gravy, onion, Worcestershire sauce, and allspice. Add the meatballs and stir until thoroughly covered with sauce. Cover with the lid, make sure the vent is closed, and set to high pressure for 8 minutes. When done, quick-release the pressure. Meatballs From Scratch: Instead of using pre-cooked frozen meatballs, make them from scratch. Mix 1 pound of lean ground beef with 1/2 cup Italian-style breadcrumbs and approximately 1/4 cup finely chopped onion. Add one egg, 1/4 cup milk, 1/2 teaspoon salt, 1/4 teaspoon ground black pepper, 1/2 teaspoon Worcestershire sauce. Mix with clean hands until just combined. Shape into 1 1/2-inch meatballs and place them 1 inch apart on a prepared baking sheet. Bake for 18 to 20 minutes in a 400 degree F oven.